Black is beautiful. This simple phrase is what immediately comes to mind when experiencing the Lion Forge /Magnetic Press published, Black Comix Returns, the sequel to the acclaimed Black Comix: African American Independent Comics Art & Culture. This compilation of black comic book history is astounding, with close to two hundred varying artistic styles and perspectives that wow the imagination with unique takes on life, whether sci-fi, “super”, or realistic in their approach. The one unifying concept is that the Black experiential diaspora connects everything present here. John Jennings and Damian Duffy, creators of both Black Comix entries, started this project back in 2010. They began this due because “it highlights a comics culture that has been otherwise too little discussed.” Black Comix was created and became a success, and with the desire to add in more indie artists, they took to Kickstarter to fund their newest endeavor. 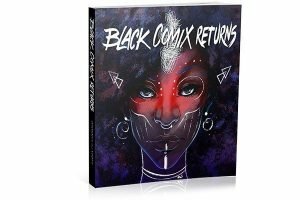 The desire for Black Comix Returns was immense as John and Damian received almost triple of the initial funds asked for, and now the final finished product is here for all to consume. The work included here spans from long time writers to newer artists, to men and women from across the planet from all walks of life. Black Comix Returns formula is to subtly draw the reader in with a quick synopsis of the writer and/or artist on each page, but then leaving huge swaths of area for the creators work to speak for itself. The eye is then drawn from reading the paragraph over to jumping directly into the individual artists work. It was a treat to go through each contributor’s history and accomplishments. The context of the history of individuals give a sense of someone sharing their personal work with the reader. The additional website nod allows one to delve more into their favorite creators and get more insight into personal stories. The medium of comics has fought to be included in the lexicon of true artistic application since its inception. Add in the words independent and African-American into this mix, and one can understand the uphill battle that creators have been striving to break for decades. Black Comix Returns is a beautiful volley across the bow of the status quo. One could spend hours in this book and not have dented the enormity of pages within. It is truly a visual masterpiece of Black culture.